Check out your local Menards Flyer, valid April 14 – April 21, 2019. 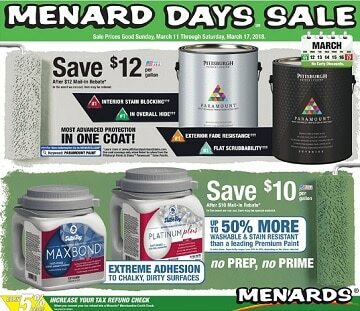 Save with this week Menards Ad, grocery deals and building materials promotions & offers. Find super savings for groceries, building supplies, automotive products, paints, refrigerators, kitchen appliances, patio furniture, pet food and supplies, recliners, household products, Mastercraft doors, bathroom & patio furniture, gardening, air continioners, power tools, hardware, storage & organization, hardwood flooring, apparel, and more.